Third Test, Perth: Scorecard; Smith - the best since Bradman? Because of rain today, play will begin half an hour earlier on day five at the Waca at 02:00 GMT. Test Match Special will be on air from 01:45 on BBC Radio 5 Live Sports Extra and Radio 4 Long wave. On that note, that is it from us but don't forget to catch the Pint-Sized Ashes and you can read today's report by clicking here. Former Australia fast bowler Glenn McGrath posted this message on Instagram: "The covers are on at the WACA and the forecast for tomorrow not looking to good. Will rain save England?" Can the weather save England? Australia bowler Josh Hazlewood: "I'd like five or six more (to hit the crack) tomorrow. "You only need a couple to straighten off it and you are in the game. "It's a pretty simple method, there is not much more out there to aim at than that crack." England batsman James Vince: "I think we try and put the rain to the back of our minds. "We've got to have belief that we can save the series and get over the line tomorrow. "It's going to be tough. I'm sure there's going to be some good balls flying around out there. "But these two (Dawid Malan and Jonny Bairstow) especially showed in the first innings that they can occupy the crease for a long time, so hopefully they get off to a good start in the morning." James Vince played beautifully. He plays pure cricket strokes. He's a lovely player to watch. You felt it was going to be his day. Then all of a sudden he got what we are probably what we are going to describe as the ball of the 21st century. There was nothing you could do about that. One of the rare positives about today was the 55 scored by James Vince. 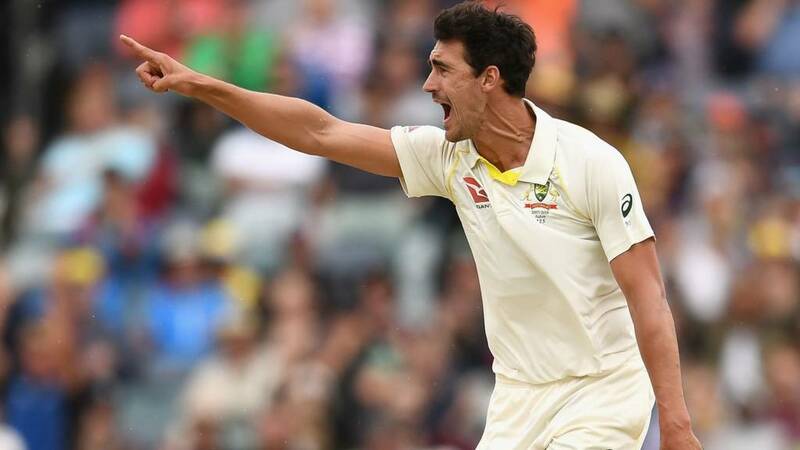 He was under pressure after recent failures and looked like he was in full control until Mitchell Starc bowled an absolute corker which caught a crack and went from going going down the leg side to hitting the off stump. Steve Moss: Years ago if playing squash with a lesser opponent, we'd allow them to score points off either serve or with tennis we'd just have one serve, couldn't Aussies give our batsmen 2 innings to their one & make a game of it? I'm not going to start questioning Stuart Broad. I think he has bowled OK without a great deal of luck. He is just as likely to get three or four in the first innings in Melbourne next week. I'm definitely sure England won't look to change him. Australia's innings saw the third time that five England bowlers have gone for a 100 runs. The others were against Australia in Cardiff in 2009 and West Indies in 1973 at Lord's. Phil Clark: So many comments spot on re senior players not making their needed contributions. Cook, Root and, yes, Broad also needs to look at his game. I fear a defeat here will leave the team psychologically beyond repair. A bit of good but mostly bad for England on day four at the Waca. England bowler James Anderson quickly removes Steve Smith (239) and Mitchell Marsh (189) before Mitchell Starc is run out for one. Tim Paine and Pat Cummins pile on the misery for the tourists as they put on 93 as Australia put up 662-9 declared in response to Engalnd's first innings of 403. Mark Stoneman (3), Alastair Cook (14) and Joe Root (14) are dismissed to leave England at 60-3. Mitchell Starc bowls a sensational delivery to bowl James Vince for 55. Rain stops play with Dawid Malan and Jonny Bairstow at the crease and England on 132-4 - still 127 behind. In this series, Aussie skipper Steve Smith averages 142, while England captain Joe Root averages 29.33. I don't care if Joe Root is the captain. He's a lovely lad and he comes from Yorkshire like me but it was 2ft wide. He didn't need to play at it. It was a push drive nothingness. You wouldn't play that in a normal day's cricket and today's not normal - we are trying to save the game over nearly five sessions. It was a poor shot. England captain Joe Root's scores so far this series have been 15, 51, 9, 67, 20 and 14. Today he was out off Nathan Lyon's first ball. It was wide of his off stump and Root got an edge which went off wicketkeeper Tim Paine's gloves before being caught by Steve Smith. When Australia declared on 662-9 after lunch it was the highest total by any side down under in Ashes Test matches. When I stopped playing, I had a lot of anger, because I wanted to carry on playing. I don't suppose there are many people who go away and think 'I reckon i could still do better'. I was angry because it was taken away from me - I couldn't feel my hand any more, yet the rest of me still thought I could do it. That's what it'll be like when Cook eventually finishes. It's not a good place to be in mentally. That's why it helps if you have a young family or something to take your mind off it. It makes you realise cricket is just a game. Alastair Cook is in that type of form - I've been there. He's in that type of form where his footwork isn't good. He is striving like hell, he is working and trying but nothing is going for him. He's never got out of the batting crease. This time he was back in the batting crease pushing forward. I can feel for him. Once you get technically out of nick, your feet are not going right, you need matches. He just got get the foot out to the pitch of the ball.